On July 15 while visiting Egypt, U.S. Secretary of State Hillary Clinton had her motorcade pelted by tomatoes and shoes by a mob of angry protestors. You don’t have to be a charter member of the Hillary fan club to be bothered by this. They weren’t just attacking Clinton; they were attacking the U.S. itself, as evidenced by the nature of the signs they bore. And what starts out as footwear and a fruit often mistaken for a vegetable quite easily could develop into shoe bombs and bullets. But what makes the incident particularly interesting is that — again, as evidenced by the signs — the mob was angered over a mistaken impression that the United States had interfered in Egypt’s elections. Egyptians, it appears, are just as capable of gullibility as Americans. And they got that false impression from some of Clinton’s fellow Americans — specifically, from several character assassins who are obsessed with bringing down President Obama and anyone connected with him at all costs. When anyone, not least a member of Congress, launches specious and degrading attacks against fellow Americans on the basis of nothing more than fear of who they are and ignorance of what they stand for, it defames the spirit of our nation, and we all grow poorer because of it. Even one of her former advisers urged her to put a sock in it and apologize. Instead, she made another unfounded allegation of terrorist ties against Rep. Keith Ellison (D-MN), the first Muslim to be elected to Congress. In the eyes of many right-wing extremists, you see, all Muslims are potential terrorists. 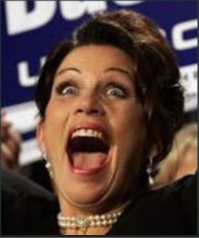 But not to worry, Bachmann has plenty of fellow loonies who are willing to back her up. Glenn Beck even gave her a radio forum to encourage her. There are lots of people out there who equate (their own) ideology with patriotism and everything else with anti-Americanism. Unable to grasp the fundamental fact that there are other American values besides their own, they conclude that anyone who doesn’t conform to their ideology is hell-bent on bringing down the country. So if Obama is reelected, well, America, you will no longer recognize the country that today you truly love and can enjoy all of its freedom and prosperity and security if Obama is reelected because this “ObamaCare” is a harbinger of things yet to come. I wish the American media would take a great look at the views of the people in Congress and find out: Are they pro-America or anti-America? Remember, this woman keeps getting elected, so it appears that someone out there is actually voting for her. She has a support base of people who denounce as anti-American anyone whose principles or policies they don’t like, yet they enthusiastically support someone who actually incites — through dishonest claims — riots against American officials. The irony is so thick you could use it for a hockey puck. Previous Mass Shootings: Media Rush to Judgment? In 2003 Ann Coulter wrote a book titled, “Treason: Liberal Treachery from the Cold War to the War on Terrorism.” As we’ve come to expect from the right, this was pure projection. The real treason is being conducted by the asylum-escapee wing of the Republican party led by the likes of Michele Bachmann (it’s a large wing). These people hate the concept of a “United” States of America. They have rejected the concept of winning elections by presenting voters with better ideas. They have decided that the only victory they want is one in which their opponents are utterly discredited, destroyed, and deported. Or dead. It’s sad to watch my fellow citizens elect politicians who hate America. When Bush was in office, criticizing him in the slightest, no matter how justified, was “treason”. With Obama in office, attacking him in even the nastiest and nuttiest terms is “patriotism”. Although, he is getting plenty of criticism from the left as well.. But it’s more substantive than hes a Kenyan Mooselim! Criticism is not a problem — in fact, it’s a good thing. But criticism is very different from vicious, wacko smears and rumor mongering.